When you fall short of a championship, as the Dodgers did this year, there’s a certain game face you’re required to display — a certain stoicism or even gravity. Show any pride in partial achievement, and you risk conveying that you aren’t committed to the larger goal, that you don’t understand how important a title is, that you just don’t get it. The reality is, yes, you can feel good about the positives from a season without diminishing the craving — the gut-wrenching craving — for ultimate greatness. Pride and desire aren’t opposites. Think of your team as you would your child. To want anything less than the best for your kin would be negligent. To dismiss your children’s smaller accomplishments wholesale when they aren’t the best — that’s negligent, too. You learn from failure, but you can also feed off success. 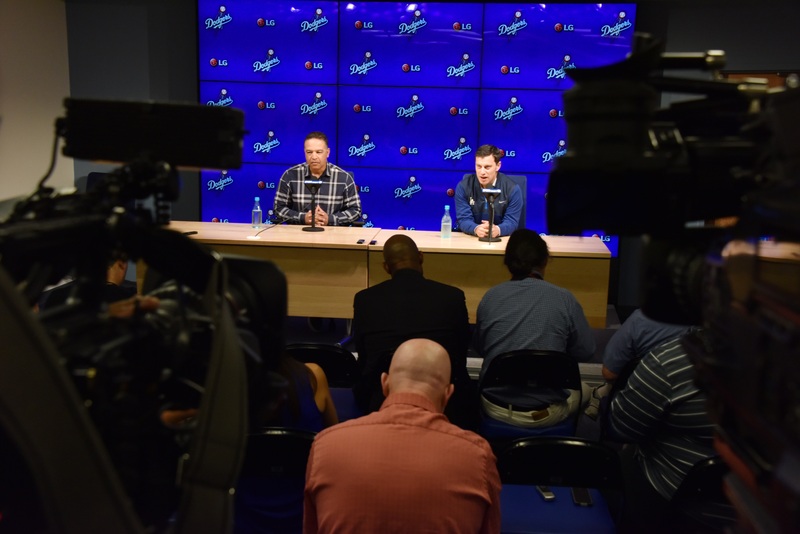 When Andrew Friedman and Dave Roberts met reporters this afternoon to bring closure to the Dodgers’ season, the different threads were front and center. No one felt ashamed of the effort or the intermediate achievements, even if no one was satisfied with the final result. In other words, there was no mistaking the determination to go farther. Pride and desire. “Obviously, the No. 1 goal is to play in the World Series, and we came up short,” said Roberts, who was named Sporting News NL Manager of the Year today. “I think a lot of good things are in place to bring a championship back here to Los Angeles. Since last December, the process of how we go about things as an organization, how the guys on the field play the game … I think we did a lot of good things. One of these years, it wasn’t going to happen. 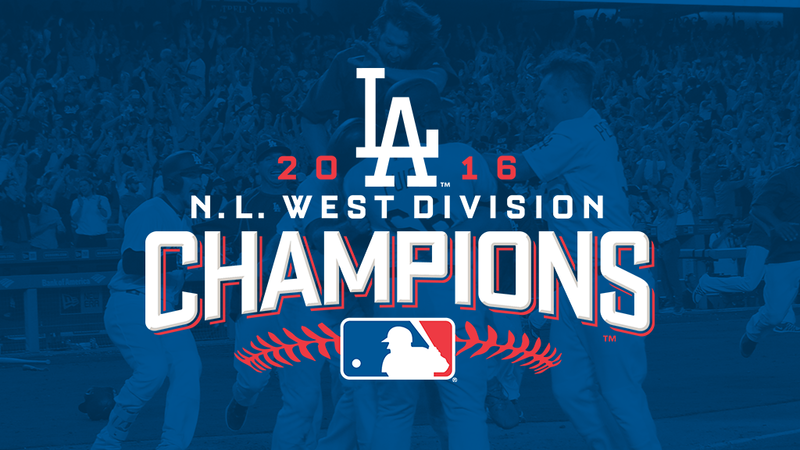 One of these years, the National League West title would go to someone else. Three months ago, 2016 looked dangerously like it would be that year. The Dodgers began the season in pursuit of their fourth straight division championship, but on June 26, eight games down in the division, one ace down on the disabled list — it was a feeding frenzy for those looking to bury Los Angeles. Exactly three months later, on September 26, the Dodgers will wake up not eight games down in the NL West, but eight games up — and playoff bound. Instead of surrendering with Clayton Kershaw out, the Dodgers found a deep resolve. Not coincidentally, it came from a deep roster. “We talked a lot at Spring Training about depth in the organization,” president of baseball operations Andrew Friedman said, in the bombastic clubhouse after today’s clinching victory over Colorado. “It wasn’t something that we were necessarily eager to showcase, as early as we did and as often as we did. But it’s an incredible organization. The number of fingerprints on this division title spans so many different players and so many different departments in our organization. So many people can be proud of it. And for Vin Scully, unbelievable. At Vin’s final day broadcasting at Dodger Stadium, as the shadows crept across the infield, Charlie Culberson homered — his first of the season — to give the Dodgers a 4-3 walkoff, 10-inning victory over the Colorado Rockies — and their fourth consecutive National League West title. After going the life of the franchise without making the playoffs in three straight years until 2015, the Dodgers have extended their streak by one. Dave Roberts joined Tommy Lasorda as the only rookie managers ever to lead the Dodgers to a division title. The victory sets up a National League Division Series matchup with the Washington Nationals, who clinched the NL East on Saturday. Game 1 of the NLDS will be October 7, with the Dodgers narrowly behind the Nationals in determining home-field advantage. 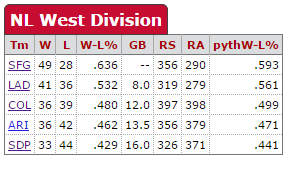 The Dodgers own the tiebreaker if the teams finish with identical records. 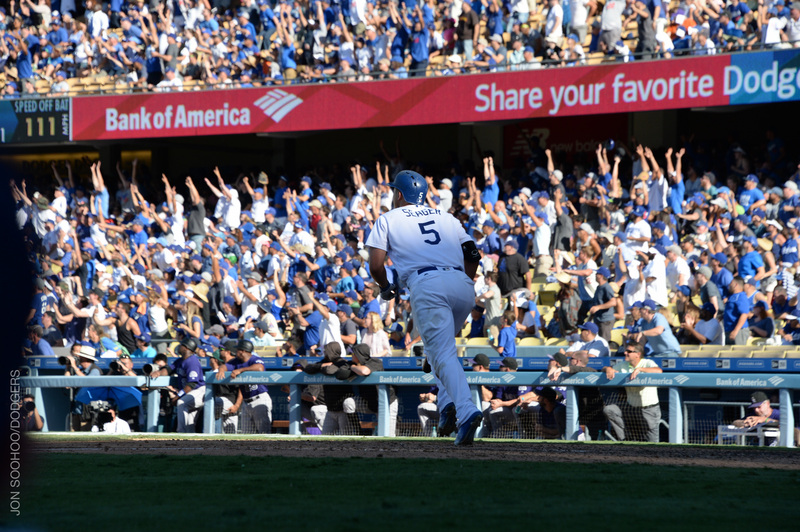 In a season replete with resolve, the Dodgers rallied from two deficits — and won without leading until after the final pitch was thrown. In his first MLB start since August 13, Brandon McCarthy made his longest appearance since July 22. Retiring the first six batters he faced on 25 pitches with four strikeouts, McCarthy then allowed two runs in the third inning, but recovered to face the minimum in the fourth and fifth innings. For the day, McCarthy threw 79 pitches in 5 1/3 innings with six strikeouts, and notably walked only one. It was his three consecutive starts walking a career-high five in early August that signaled his need to return to the disabled list. Following a Howie Kendrick single and Justin Turner double to begin the third, the Dodgers cut the Rockies’ lead in half on Yasiel Puig’s sacrifice fly, but couldn’t convert any of their other eight baserunners in the first six innings into runs. David Dahl’s ninth-inning home run off Kenley Jansen looked to deny the Dodgers their opportunity to win their way into the NL West title. The immediate consolation, as Dahl’s drive sailed over the fence in right-center, was that San Diego took a 4-3 lead over San Francisco in the bottom of the seventh, extending the possibility of a home clinch. But with two out in the bottom of the ninth, Seager drilled a 112 mph shot off Rockies reliever Adam Ottavino (aiming to rebound from his five-run, ninth-inning meltdown August 31 against the Dodgers) to tie the game again. Joc Pederson, batting for Yasiel Puig, walked against Boone Logan. Gonzalez came to the plate and hit a solid opposite-field drive but a can of corn nonetheless, and we would play on. With two out in the bottom of the 10th, Culberson, who spent much of the season in the minors, no-doubted an 0-1 pitch over the fence in left, and the celebration began for the Dodgers — bot thanks to the Giants, but thanks to themselves. On Wednesday, the Dodgers played what they hope will be their last game with Clayton Kershaw on the disabled list. The standings (seen at right) for those 73 days without their incomparable star, at least on the surface, tell as unexpected a story as one has seen from the Dodgers since 1988 — a story equal to if not beyond their 2006 playoff push after going 1-13 to start the second half of the season, the Manny Ramirez-led charge to a division title in 2008 or the 42-8, last-to-first comeback in 2013. That the Dodgers have gone from eight games behind the Giants in the National League West to five games ahead, without their best pitcher (or double handfuls of other injured players at given moments), speaks to something beyond magic, let alone the Giants collapse. Playing .613 ball, a winning percentage second in MLB only to the Cubs, has been a result of a level of talent and depth that few seemed to appreciate when Kershaw went down. 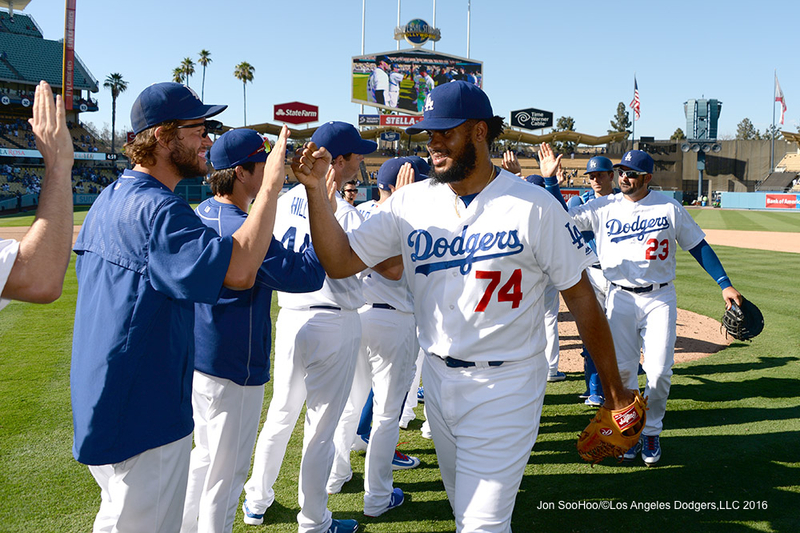 In the latest Dodger Insider cover story, we trace the evolution of the 2016 Dodgers from what was perceived to be a one-man team into an all-hands-on-deck, grinding contender. Eighty-five games after they last held the lead, 41 games after Clayton Kershaw last held the mound, the Dodgers have returned to first place in the National League West. Three hours after the Dodgers pounded the Phillies, 15-5, San Francisco put runners on second and third with one out in the ninth inning but fell to Pittsburgh, 4-3, giving Los Angeles a view atop the division for the first time since May 10. The bookends? Home runs by Mets pitcher Noah Syndergaard, who hit two off Kenta Maeda on May 11 to knock the Dodgers into second place. Tonight in Arizona, Syndergaard hit his third homer of the year, heralding the Dodgers’ re-ascension. Since June 26, the Dodgers have gone 25-16 (.610), while the Giants are 17-25 (.405). 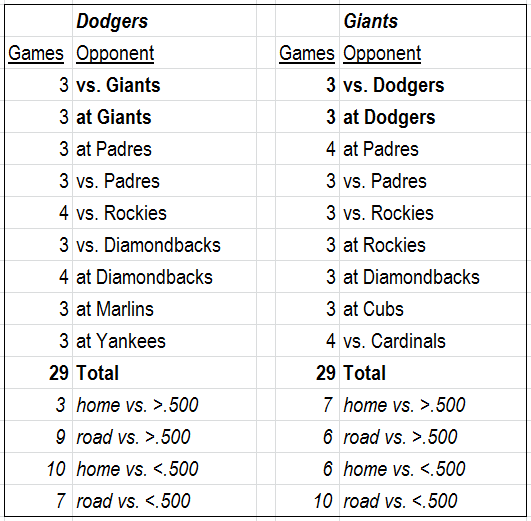 The Dodgers have 44 games to play, and nine of them — more than 20 percent — against the Giants. The 1916 National League champion Brooklyn Superbas used 10 pitchers to throw their 1,427 1/3 innings. The 2016 Los Angeles Dodgers used 15 pitchers to throw 54 innings last week. Some people — even those under the age of 100, have noticed the difference. Let’s separate Yasiel Puig’s fate as a baseball player from his fate with the Dodgers for a moment. 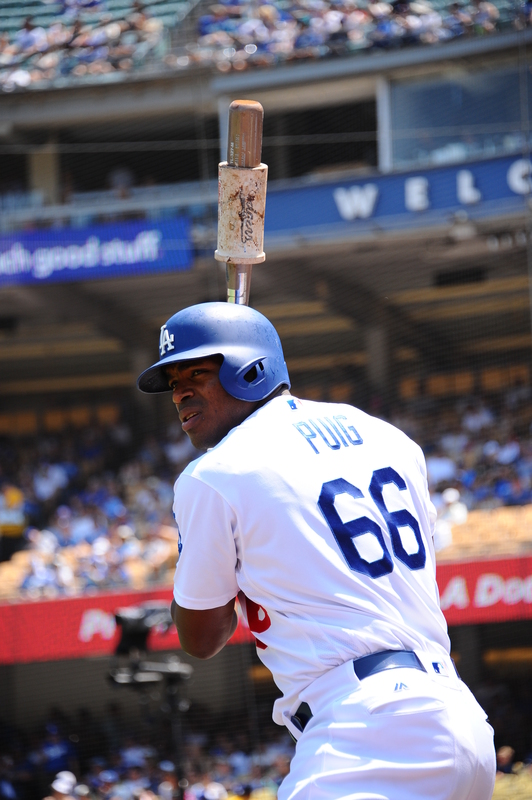 It’s certainly a convenient time to do it, with Puig on his way to Triple-A for the first time. He is a Dodger, and yet not a Dodger, and to say the least the baseball world is still processing it. First comes the blame. Some say Puig had this demotion coming. Some say the Dodgers have mishandled his development. It’s easy to throw stones when there’s a free pile of ’em lining both sides of the Internet. No one’s claiming to be perfect, but no one should think it was easy. What seems relevant to me is that it has never been in anyone’s interest to see Puig be anything less than the best he can be. That remains the case. Maybe Puig’s next Major League game will be in another uniform. Maybe it’ll be in familiar, cozy L.A. whites before the next homestand is over. Maybe his next chapter won’t be written until 2017. Even then, the next chapter will only be a chapter. 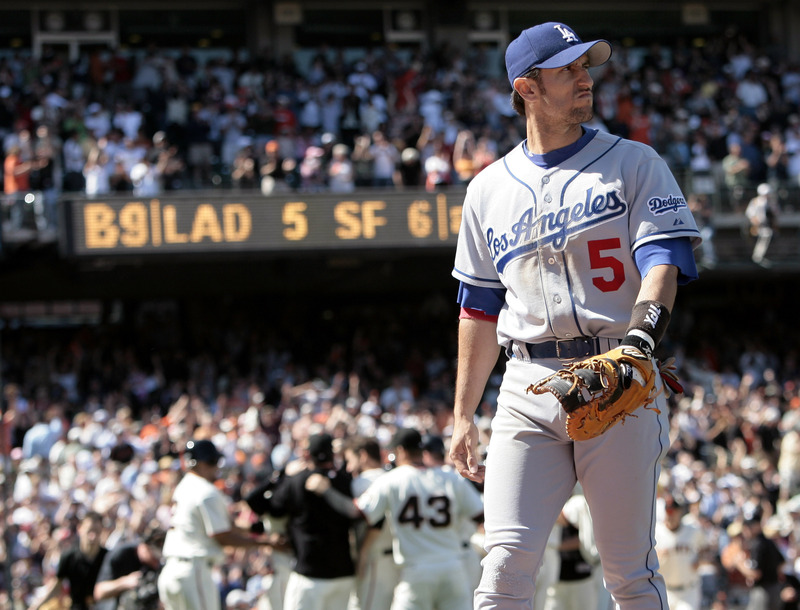 On this day 10 years ago, the 2006 National League West champion* Dodgers lost their eighth game in a row. It’s a contradiction that, frankly, should provide comfort to the 2016 NL West-leading San Francisco Giants, who have lost eight of nine games since the All-Star Break, allowing the Dodgers to come with 2 1/2 games of first place for the first time since May 18. But the larger point is that even with four months of baseball nearly in the books, nothing is decided. 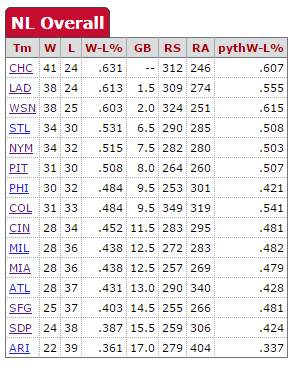 Those 2006 Dodgers, man, were they a roller-coaster team. After starting the season 12-17 and falling into the division’s basement (remember, this was a team that had gone 71-91 the year before), they won 15 of their next 18 and ultimately moved into first place by early June. But it was a tight, crazy-making race. On the first four days of July, Los Angeles finished the night in a different position in the division: second place on July 1, fourth place on July 2, third place on July 3, tied for first Independence Day. Then came the All-Star Break, and a horror show worse than even the Giants have experienced. The Dodgers went from 46-42 to 47-55, losing 13 of 14 to fall back into last, 7 1/2 games behind the Padres. Jake Peavy, who pitched Monday for the Giants, was the winning pitcher for San Diego on July 26, 2006 in the completion of a three-game sweep that seemed to doom Los Angeles. The next day, July 27, was an off day, and I published a column for SI.com in which I said the Dodgers shouldn’t feel stigmatized about being sellers at the trade deadline. So what happened next? Oh, nothing much, except the Dodgers won their next 11 games and 17 out of 18, again moving all the way from last place to first. I got to write a whole new column for SI, one that began with a quote from Vin Scully.